Raspberry Pi is a natural fit for the IoT world. Do-it-yourselfers and startups especially like Raspberry Pi for its low cost, small form factor, and versatility. There is also an entire library of software solutions that make adding your own unique functionality to a Raspberry Pi system relatively easy. The Raspberry Pi can also run Windows and Linux, and Microsoft has even dedicated an entire section of its website to using Windows with Raspberry Pi to power Internet of Things projects. There are also entire Linux distros created specifically for Raspberry Pi. When it comes to creating the software that drives these IoT projects, great software development tools are needed. This is where Node-RED comes in. Node-RED is cross-platform. It runs on OS X, Windows, and Linux. In fact, it’s included in the “Jessie” release of Rasbian as a pre-installed app. What does Node-RED actually do? It enables you to “wire” together different pieces of data and coordinate that information with hardware. So, for example, if you wanted to have your coffee pot turn on every time you tweet about coffee, Node-RED would be a great tool for handling the link between Twitter and your coffee pot. You can assemble your flow with click-and-drag ease from your browser. Node-RED is controlled from a browser-based UI, enabling you to quickly search for and deploy various nodes used to assemble your flow. A flow basically a series of nodes assembled so that they perform the action or actions you want. Node-Red has its own library of flows you can choose from, but you can also take advantage of the NPM library to find nodes to add to your project. 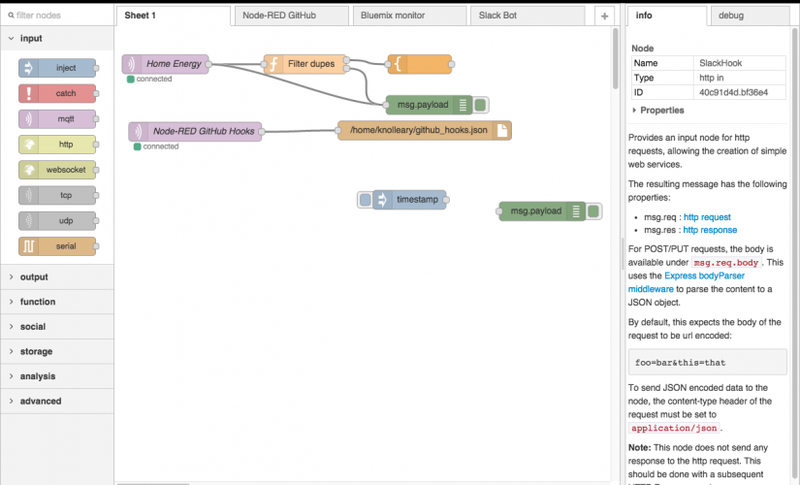 If you’re in the business of creating IoT solutions, or just a beginner looking to dip their toes in practical IoT development, Node-RED offers an inexpensive place to start.